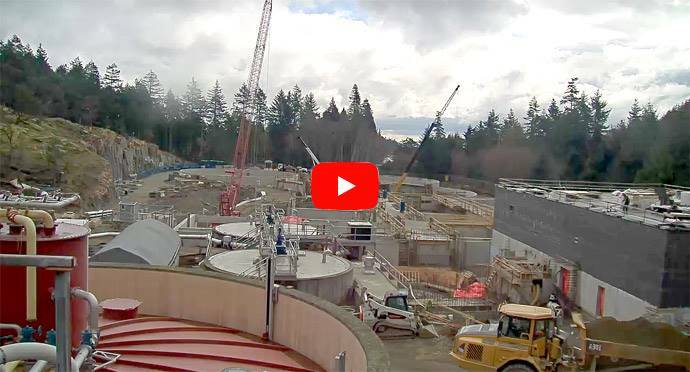 The Greater Nanaimo Pollution Control Centre Secondary Treatment Upgrade Project will provide secondary treatment for wastewater from the City of Nanaimo, District of Lantzville and Snuneymuxw First Nations. The Greater Nanaimo Pollution Control Centre (GNPCC) is located at 4600 Hammond Bay Road in Nanaimo. Construction of the GNPCC Secondary Treatment Upgrade Project began in May 2017 and will continue to December 2019. This project will be built by NAC Constructors Ltd. with engineering oversight and quality control by AECOM Canada Ltd. This project will also employ many local subcontractors for various subtrades. Click the image above to view the construction live feed. Many questions about the GNPCC Secondary Treatment Upgrade Project are answered below. If you have further questions, please contact Wastewater Services, at 250-390-6560 or email rcu@rdn.bc.ca. Where can I find project updates? What level of treatment does GNPCC currently provide? The GNPCC currently provides chemically-enhanced primary treatment which uses settling tanks and gravity to treat wastewater. Secondary Treatment uses micro-organisms to consume suspended solids in the wastewater as their food supply. It will be used in addition to primary treatment to produce a higher quality effluent. Why is GNPCC being upgraded to secondary treatment? The project will provide additional capacity for planned growth and will meet a commitment in the RDN's Liquid Waste Management Plan. It will also meet provincial and federal regulations which require that all municipal wastewater treatment facilities provide secondary treatment or better. Secondary treatment will improve the quality of effluent discharged to the Strait of Georgia. The project budget is $82 million including contingency. The project will be paid for through a combination of reserves, development cost charges, borrowing and grant funding. What kinds of construction activity can I expect? What are the expected hours of construction? Typical construction activity will conform to the City of Nanaimo Noise Bylaw which states that noise due to construction shall not be caused before 7:00 am and after 9:00 pm Monday to Saturday and before 9:00 am and after 9:00 pm on Sundays and Statutory holidays. Many concrete pours are scheduled throughout 2018. Large pours may require that work continue outside of standard construction noise bylaw hours. Additionally, critical process modifications will occur several times throughout 2018 and 2019. Such work must be done at night when flows to the plant are lowest and plant flows can be shut down for a significant length of time. Note that rain has a large impact on plant flows so shutdown schedules may change based on weather conditions.